About a year and a half ago, Eau Claire native turned Floridian Steve Turk released a gripping historical thriller, Solomon’s Executioner, with great success. 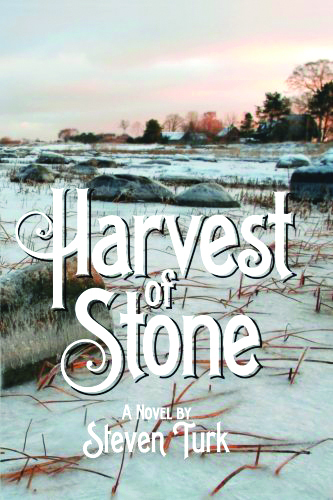 This past October, he released a new novel with a different, uplifting tone entitled Harvest of Stone – the title being an ode to the stones that litter the fallow field metaphorically connecting to the guilt and anger weighing down a particular character. The story focuses on Gunnar Nilsson, the son of Swedish immigrants. In Turk’s words, the novel traces Gunnar’s “odyssey from a hardscrabble life in Chicago’s notorious Swede Town slum to one of near isolation on a rundown farm in the bucolic hills of Black Earth, Wisconsin, where he is indentured to a reclusive, emotionally scarred, civil war veteran, Tobias Wren, and his nearly blind wife, Emily.” Gunnar’s journey goes on to involve emotional confrontation, family relationships, and a tumultuous love story. The tone of this novel is noticeably different from that of Solomon’s Executioner, and Turk shares that he didn’t want to write the same novel twice. Even though the new book is also based on real characters and events, it isn’t a dark thriller. “Maybe Harvest of Stone was in some part a way of redeeming myself by showing I could write an uplifting novel with literary appeal,” Turk says. Turk hopes readers will be transported to another time and place; meet complex, interesting characters; and learn to put down the unnecessary baggage, insisting that they’ll “walk taller and see farther” if they do.